Bandsintown is a service where users can find concerts and performances near them. Apart from serving location based information, the site also offers rich possibilities for registered users to interact with each other and filter events, based on Last.fm or Pandora user profile. Visit Bandsintown.com for more information. Bandsintown Layar is an Augmented Reality layer which is loaded in the popular Layar application, currently available worldwide on Android powered devices and soon available for iPhone as well. Bandsintown Layar finds concerts and performances which will take place within a certain distance from your current location. It then displays the results as a Reality Layer (in the camera view of your phone), on a map or in list view in the Layar application. How do I access the Bandsintown layer? Start the Layar application and open the Layers tab. Now open the Search tab and search for bandsintown. If you installed a barcode reader on your android phone, you can take a picture of the QR code (image to the right) to open the Bandsintown Layer. Nice, just click the QR code image to open the Bandsintown Layer link. How do I find concerts and performances? When you open the layer, you will be presented with a filter settings screen, where you choose how many days in advance you want to look ahead and within what range you would like to look for venues. When you are satisfied with your settings, press OK and Layar will load the Bandsintown using these settings. 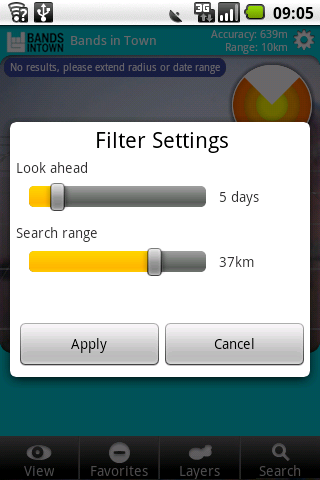 If you get too little or even no events, you may want to revisit this filter dialog and increase the look ahead period, the search range or even both. Venue location accuracy; while most venues are exactly positioned at their street address location, some are not and may be shown at some random position near a local area’s center (e.g. center of a neighborhood). Please make sure that the venue’s location is correct before using map view or the “Take me there” menu option. Only the first event per venue is shown; for instance if a popular venue has performances tonight, tomorrow and the day after, only the performance tonight is shown in the Layar results. To see more events taking place at the venue, select the action menu option: “More at venue name” (see below). Concert at Venue name; this action is only available if there are still tickets available for the event. When you select this menu, you get an overview of available tickets and services where you can buy tickets. There is also a “Email Link” option, which lets you send a link to the ticket service to yourself or a friend in order to open the information on a more convenient desktop computer. Artist name on tour; takes you to a web page where all concerts or performances by this artist are shown. From there you can get more information about those concerts or send a link per email. More at Venue name; gives you an overview of all concerts or performances at this venue. From there you can get more information about those concerts or send a link per email. Take me there; opens the local mapping application on your phone where you can plot a route to the venue. Be sure to check for correct location of the venue, see limitations in this FAQ. Note: all detail pages are directly retrieved from bandsintown.com so all content as displayed is up to date with the current information at the Bandsintown website. Please note that all data is provided by Bandsintown. Squio.nl is not responsible for any errors in the data or locations. Please make sure you understand the limitations and double check accuracy before making decisions.